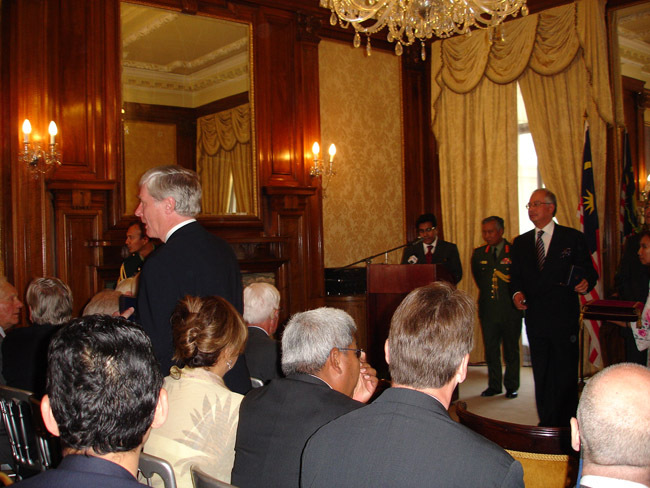 On Wednesday, 19th July 2006, the first British PJMs were presented at the Malaysian High Commission in London. The medals were presented in boxes, not pinned on for wear, by the Hon. 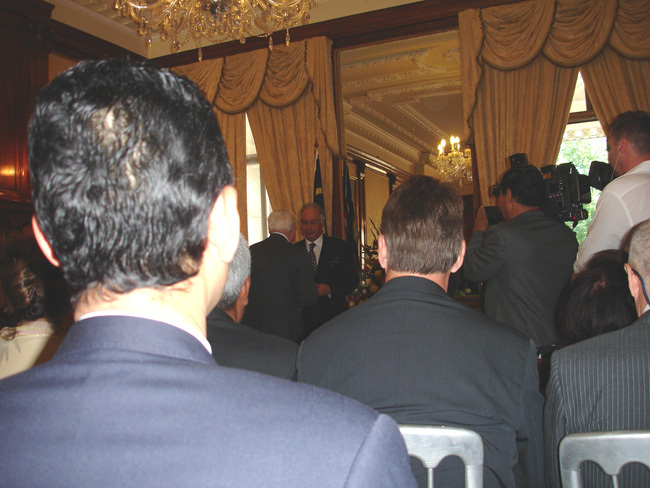 Dato' Sri Mohd Najib Tun Haji Abdul Razak, Deputy Prime Minister and Minister of Defence, Malaysia who gave a moving speech. These few piccies are hot off the griddle from London (the temperatures exceeded 42.5 degrees - hotter in the concrete jungle). Jane took them - we hope to have lots more to show you soon. 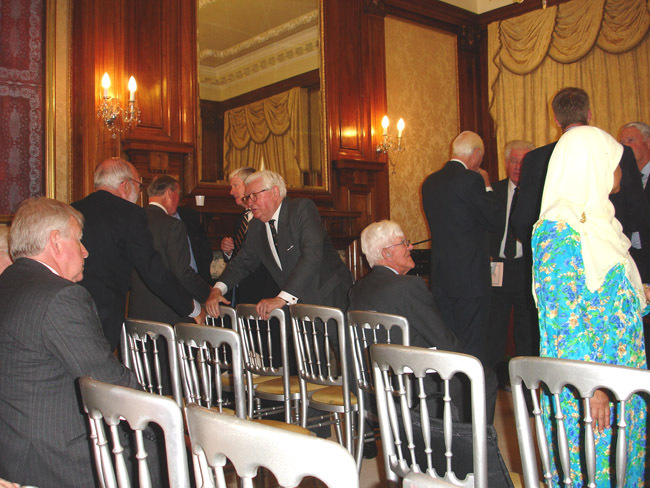 Field Marshal the Lord Bramall gets his message across ... across several chairs. He has been a tireless supporter of the PJM. 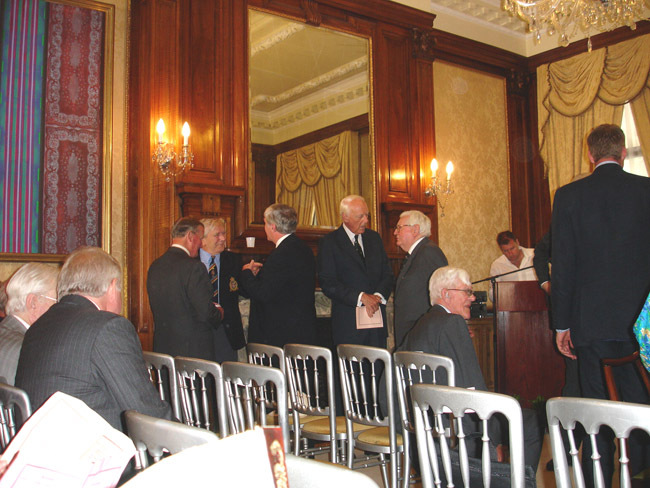 Major General Corran Purdon, Fred Burden and BarryF in a huddle discussing tactics next to General Johnson and FM the Lord Bramall (excellent catchment area for name dropping, by the way). Another piccie of the huddles - this time with General Mackenzie on the right. 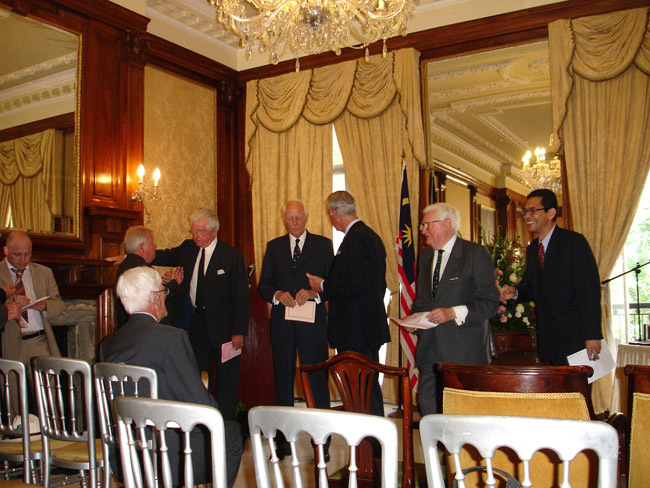 FM the Lord Bramall receives his PJM from the Malaysian Deputy Prime Minister. 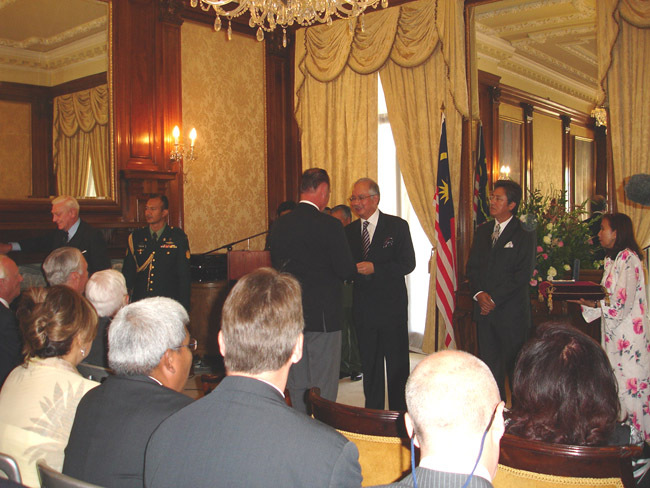 BarryF getting his boxed medal and, on being asked by the Malaysian Deputy PM, taking the opportunity to explain (in one brief sentence) the Fight4thePJM Lapel Badge that I was wearing. BarryF lost! Having got his boxed keepsake he's trying to find his way home. 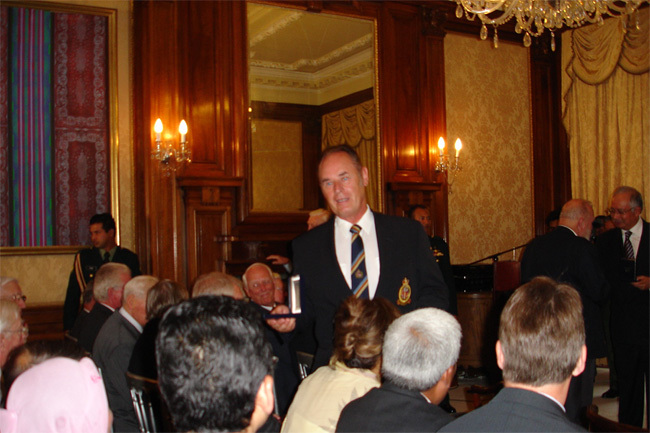 Trevor Devine (ex-Royal Artillery and ex-28 Commonwealth Brigade) receives his medal. Fred Burden gives a vote of thanks after the presentations. Trevor Devine returns with his Pingat Jasa Malaysia. 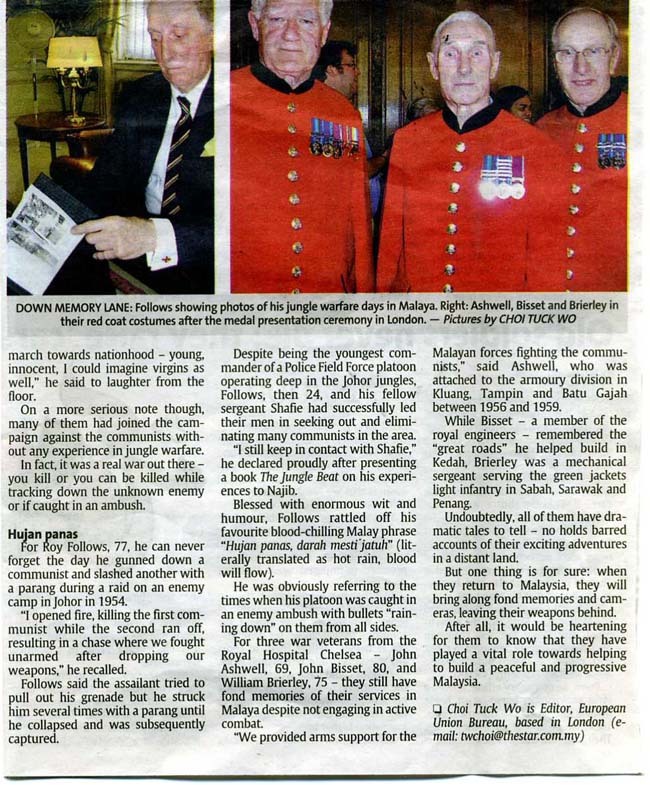 One of the three Chelsea Pensioners receives his medal. 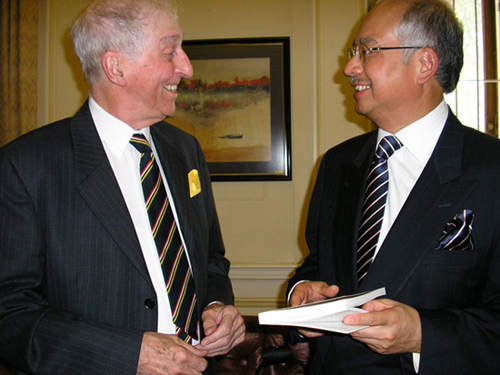 Field Marshal the Lord Bramall KG, GCB, OBE, MC receives his PJM. David Pilditch of the Daily Express (taking statements in a shorthand he clearly couldn't read when he got back to his office! 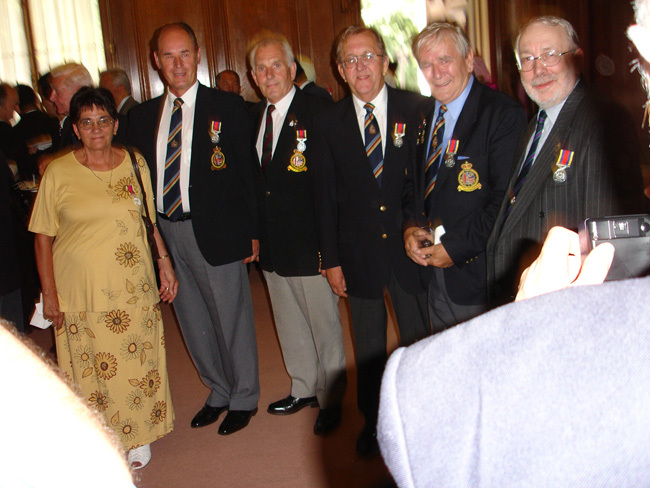 ), sitting - Prince Phillip's Private Secretary Brigadier Sir Miles Hunt-Davis KCVO CBE, two un-named, General Sir Garry Johnson KCB OBE MC (Patron, NMBVA), General Sir Jeremy Mackenzie GCB OBE (Governor, Royal Hospital Chelsea), and Field Marshal the Lord Bramall KG GCB OBE MC. 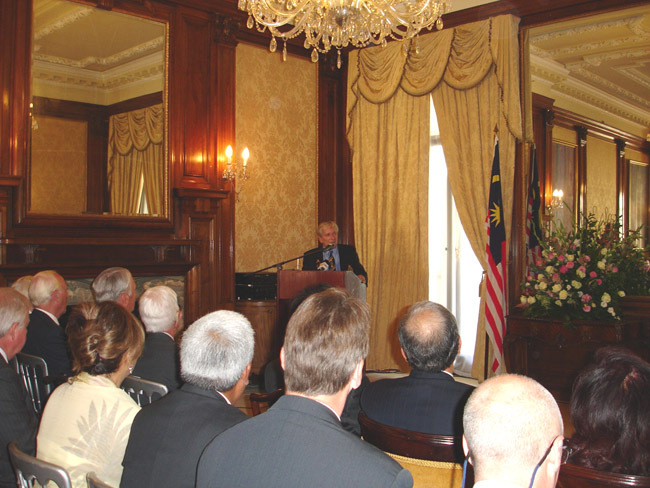 Roy Follows has kindly sent in two photographs from the Presentation of the first british PJMs at the Malaysian High Commission. 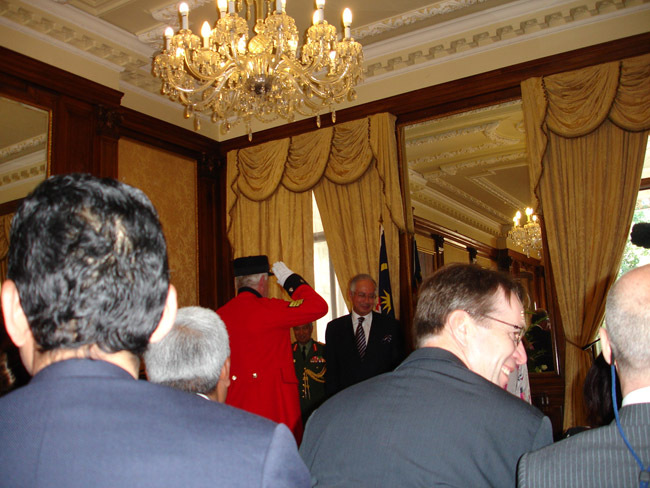 "I was one of the fortunate few who had the honour to represent The Royal Malaysian Police at the PJM award ceremony. So thanks to yourself and all the others campaigners in making it happen. Although now over the first hurdle , the second one -allowed to wear it - I'm sure the government will eventually cave in. Enclosed please find photographs of myself sharing a few pleasant words the DPM of Malaysia, and one taken during an interview. Thanks again for the hard work you and your team have put in. Best wishes Roy "
[Ed: I missed Roy at the MHC because I was called away by the day job. I tried twice to catch his eye but he was in great demand - it would have been an honour to shake his hand. 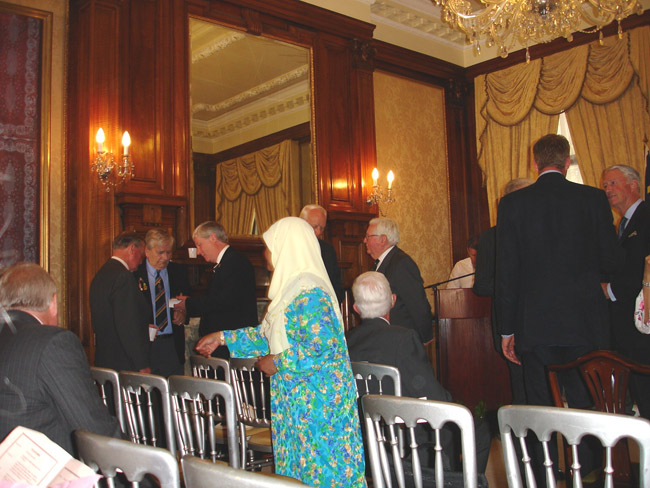 I was Intelligence Corps and worked with local people and local agencies like the Police and I became aware at a very early stage of the esteem in which the Malay Police, like Roy and his team, were still held in the mid-60's. They accounted for more of the enemy and suffered disproportionate casualties achieving stunning results in the most dangerous and forbidding circumstances. And I think he almost nobbled Chin Peng. If you can get a copy, Roy's book "The Jungle Beat: Fighting Terrorists in Malaya" is the best and most authentic account of the conflict as seen by a Malay Police Officer. You'll smell the jungle and the fear. 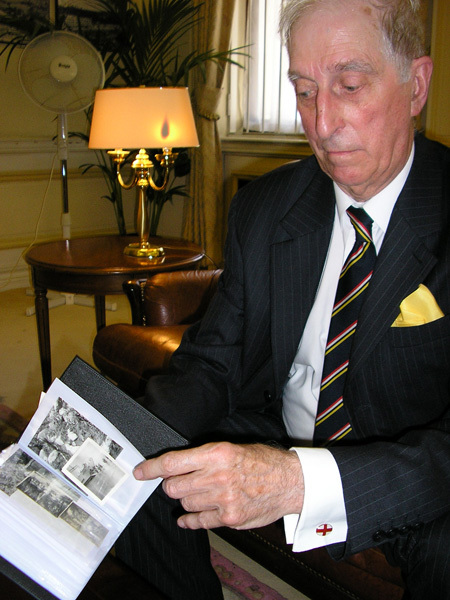 Roy presents a copy of his book "The Jungle Beat" to the Hon. 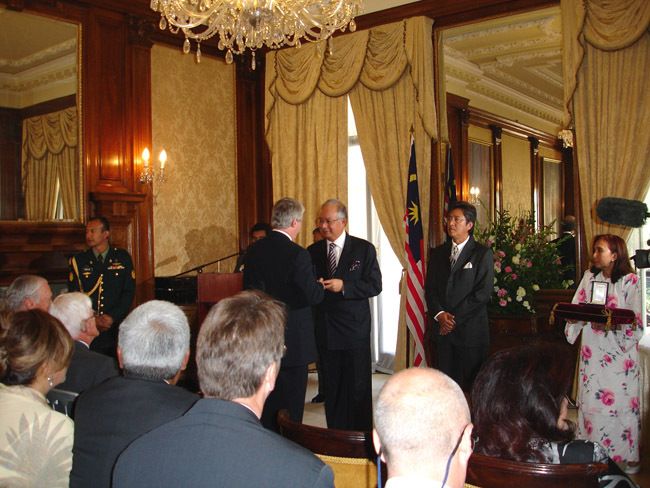 Dato' Sri Mohd Najib Tun Haji Abdul Razak, Deputy Prime Minister and Minister of Defence, Malaysia. Comment =Absolutely brilliant, well done all of you. I feel proud to be associated with the PJM cause. Comment =Does this mean that I don't have to buy my own, or will it take ages to get to 'W' like it did on pay parade? You can buy the PJM from Bigbury Mint as advertised in 'Soldier' Magazine. Message=What great photos of the medal ceremony.The Lad's who received theirs looked really PROUD and so they should. 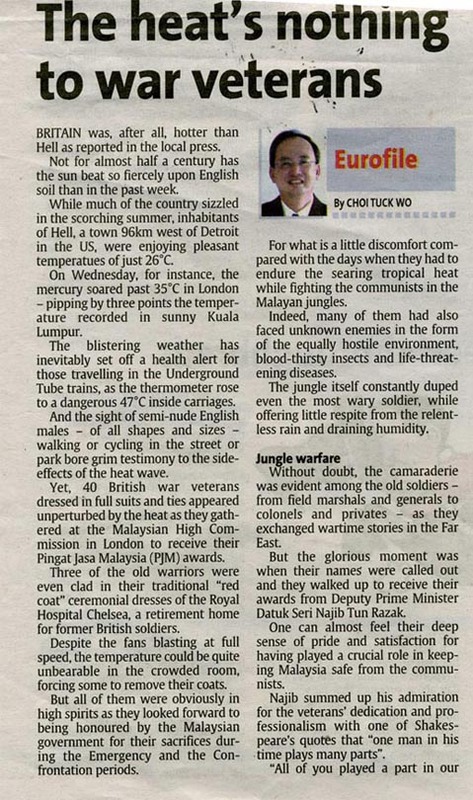 I, too, have many memories of Brunei 1962/3 when I was in "A" Coy 40 Commando Royal Marines.